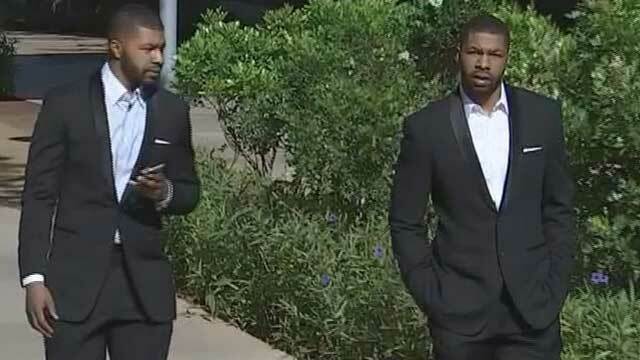 PHOENIX -- Marcus and Markieff Morris, twin brothers who play for the NBA's Phoenix Suns, have pleaded not guilty to two counts each of felony aggravated assault. Erik Hood was leaving a basketball game Jan. 24 at the Nina Mason Pulliam Recreation and Sports Complex when he was approached by one of three men who were accompanying the twins, according to court documents obtained by CBS affiliate KPHO. Someone else struck Hood on the head from behind and the victim fell to the ground, according to the court documents. Police say Hood got up and tried to run to his car, but was too dazed. He was then struck a second time, and again fell to the ground, officers said. Hood told police that five people, including the Morris brothers, repeatedly punched and kicked him. Police said Hood suffered a fractured nose, abrasions and a large bump on his head. The twins' next court appearance is set for June 30.